While uncertainties linger about the CRE market's endurance, small-cap investors are proving to be marathoners. U.S. investment activity shows little sign of fading as $38.7 billion of small commercial and multifamily properties under $5MM traded hands over the first four months of the year, outpacing by 3.1% the deal volume for the corresponding period of last year when annual property sales hit a record high. The 10-year Treasury rate move above 3% may have partially thwarted investors in the large-cap CRE space but apparently created little headwind for private and small-time investors seeking higher yielding investment alternatives to the public debt and equity markets. And Main Street business is buzzing with higher sales and profits, strong employment trends and historically high levels of optimism according to the National Federation of Independent Business. No doubt the takeoff on Main Street has also contributed to the higher deal flow by ginning up demand for owner-occupied CRE facilities. 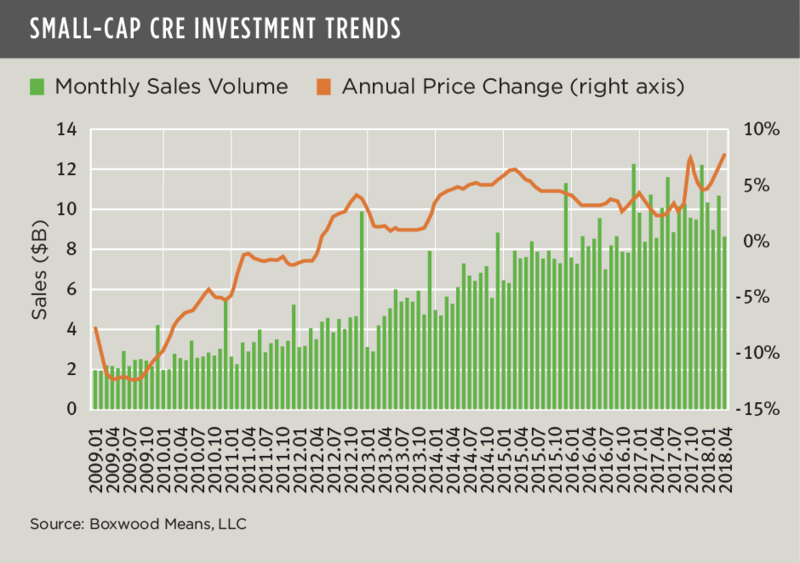 As the nearby graph shows, the mounting overall sales volume has ignited small-cap CRE prices. Boxwood's U.S. Small Commercial Price Index (SCPI) that tracks transactions in 125 markets increased 2.3% over four months, and the 7.7% gain YOY was the highest annual return on record. It took nearly 11 years to make the round trip, but as of April SCPI hovered 1.0% above its previous peak in October, 2007. By contrast, large-cap CRE prices have moderated as institutional investors continue to rein in their appetite for fully-priced assets in major markets where low cap rates have barely budged. Real Capital Analytics (RCA) reported that sales activity involving principal assets greater than $2.5MM plummeted 23% YOY. With this reversal, RCA's Core Commercial component of its national index, or CPPI (excluding multifamily), has appreciated by only 5.3% YOY in April – and 4.6% above its pre-financial crisis high. So while small- and large-cap CRE prices similarly are at record-high levels, at this late state of the cycle these two domains seem to be bifurcating: Deal activity and price momentum march on for small caps but are moving sideways if not retreating among large caps. As long as risk-adjusted returns for small commercial assets remain favorable, market liquidity and the stamina of small-time investors may well prevail.